Both of the above contribute to increases chances of backflow of the stomach contents into the esophagus. A condition in which there is protrusion of the stomach up into the opening normally occupied by the esophagus in the diaphragm [the muscle that separates the chest (thoracic) cavity from the abdomen. Co-ordinated esophageal contractions cause the forward movement of food from the esophagus into the stomach. 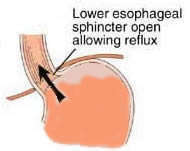 When the wave of contraction is defective, the refluxed acid is not pushed back into the stomach and it can cause damage to the lining of the esophagus. When food remains in the stomach for a longer duration, the stomach is distended for a longer time and this increases the chances of reflux of the stomach contents.